One method of doing crosshatching around applique. It is not fast but does not use a no-sew zone. This video was made before iQ was able to create no-sew zones. In this video, I use line pattern to set the almost continuous path of stitching around a Dresden plate. These two videos together show the whole process of marking then stitching. A demonstration of how to use line pattern to set a simple pattern in a border. Shows how to place a line pattern correctly into a border using horizontal and vertical shift and how to join up two patterns at a corner. Shows creating a custom corner design when using line pattern for borders. How I used Line Pattern to do custom quilting - straight line,SID and continuous curves in one pass across this Friendship Star quilt. NOTE:. 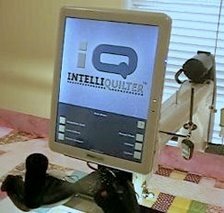 This video shows an earlier version of the iQ software. In this video I go back to my pattern catalogs to choose another pattern. This isn't necessary with the latest software version. We now have a button right on the line pattern page that allows us to toggle through the patterns we are using. See the entry for July 21, 2014 for a demonstration of that feature.